The highly anticipated new studio album from Northern Ireland's Rend Collective that nearly "broke the internet" with excitement. As Family We Go CD follows the phenomenal success of "Campfire" and "The Art of Celebration" . Rend Collective Experiment are a Northern Irish 15 piece Christian folk worship band passionate about celebration! As Family We Go celebrates the all encompassing, father-heart of God from the get go with single "You Will Never Run Away". The 11 tracks take listeners on a journey of discovering more about being one church family- stemming from the band's love of travelling as a family and feeling that they are "not so much a band but a family" and more importantly recognising the sense of belonging that comes from being a child of God. The charge of which is to share His love with the world. Not one to shy away from reality and sometimes the gritty, leading up to the eagerly anticipated release the band asked fans to share their stories of family; the loving, the heartbreaking and the joyful. The album poignantly reflects all aspects of family life and a journey well travelled. Rend collective, who since their formation, have gone on to be leading voices in the evolution of modern worship are self-described as a "group of confused twenty-somethings trying to figure out faith, life, God and community"- this could not be clearer in their new album which seeks to foster love, community and journeying as a family. The upbeat tempo, catchy rhythm and powerful lyrics ensure this will be another best selling, not to be missed album. As Family We Go CD by Rend Collective Experiment was published by Integrity in August 2015 and is our 2154th best seller. The ISBN for As Family We Go CD is 0602547283283. I've only listened to the 30 second clips and I felt the Holy Spirit touching and moving me. Rend collective seem to be writing songs that are exactly where my heart lies and my deep longing to know and to see Jesus more and more, to surrender all that I am to Him for all that He is in my life. As I hear their words I want to laugh and cry at the same time as I celebrate all that He is and all that he means to me. I'm sure that when I've heard the full tracks I will be giving 5 stars! Brilliant album, Rend continue to be amazing, their lyrics are so powerful and spirit filled, the album is so good musically and to worship to. I'm seeing them live in May, can't wait!! Take a peek at some articles related to As Family We Go CD. Got a question? No problem! Just click here to ask us about As Family We Go CD. The deluxe version has more tracks on it. Are you also making this available to purchase through Eden? 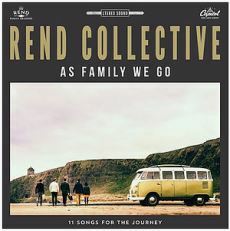 The eagerly anticipated new album from Rend Collective, As Family We Go. Highlighted by the single "You Will Never Run," the new studio record features engaging, upbeat worship that brings listeners closer to God. Hailing from Bangor, Northern Ireland, Rend Collective is one of Christian music's most exciting artists. Their previous release, The Art Of Celebration, debuted at #1 on the Christian & Gospel Chart with over 18,000 albums sold and features the hit "My Lighthouse." Rend Collective went down an absolute storm (as always) at Big Church Day Out this year. Now Playing: Celebrate Your browser does not support the audio element.